The last cycle reached its peak in 2001 and is believed to be just ending now, Longcope said. The next cycle is just beginning and is expected to reach its peak sometime around 2012. Today’s sun, however, is as inactive as it was two years ago, and scientists aren’t sure why. “It’s a dead face,” Tsuneta said of the sun’s appearance. Tsuneta said solar physicists aren’t like weather forecasters; They can’t predict the future. They do have the ability to observe, however, and they have observed a longer-than-normal period of solar inactivity. In the past, they observed that the sun once went 50 years without producing sunspots. That period coincided with a little ice age on Earth that lasted from 1650 to 1700. I would like to know how they know that there where no sunspots from 1650 to 1700. Where they looking at the sun back then? A simple change to the design of the gallon milk jug, adopted by Wal-Mart and Costco, seems made for the times. The jugs are cheaper to ship and better for the environment, the milk is fresher when it arrives in stores, and it costs less. Regardless if people like this new design or not, I think all stores are going to be using it soon if oil prices stay high. The old design is just to inefficient to keep. Johny Cash did not write the words to the song Hurt (although he did change them some to suit his own beliefs). But you would never know that from watching the music video. It has got to be one of the most artistic and well done music videos ever produced. Embedding for this clip has been disabled, so you will have to follow the link. Bill Gates complains about Microsoft products in this week’s rant of the week. The week’s essay of the week comes from Gene Logsdon’s blog and it is called Bouncing In The Wool Sack. First SAS Survival Secrets episode. Well worth watching if you have any interest at all in basic special forces craft. Unlike some many others this is realistic and not over the top. The squeal can be found here. More indebted then US households? I guess this just goes to show that it could always be worse. From the Telegraph (h/t Calculated Risk)….. Families in the UK now owe a record 173pc of their incomes in debts, official figures have shown. The ratio of debt to income is higher than any other country in the Group of Seven leading industrialised economies, and is sharply higher than the 129pc of incomes it was five years ago. The figures, published by the Office for National Statistics as part of its National Accounts, underline the scale of the coming slowdown facing the UK, economists warned yesterday. Michael Saunders of Citigroup warned that – at 173pc of household incomes – the debt burden is higher even than Japan’s when it peaked in 1990, before more than a decade of deflation. “Not only are we the highest in the G7, we are the highest a G7 country has ever seen,” he said. I know I claimed it was against my religion (or something like that) to tell people what was or was not the “best” of anything. So. . .
(1) I didn’t name them this. It’s not my fault, I swear! 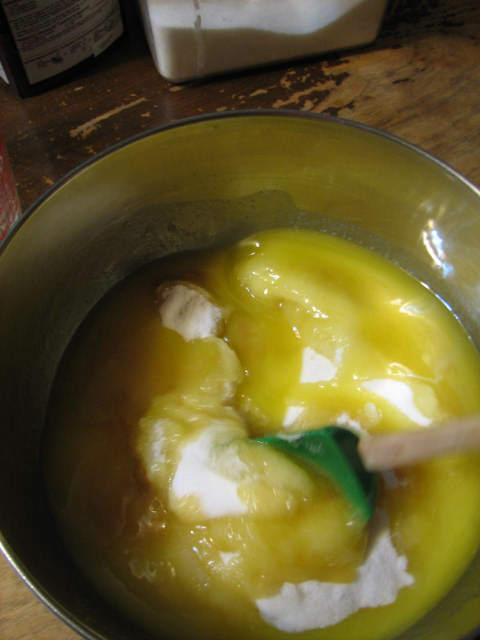 Melt your 5 1/3 sticks of butter. One time someone had these, and the boys heard her raving about them to someone else. The list of wonderful attributes included everything from tasting good, curing cancer, and being low-fat. Whoa, now! Not low fat. Not on your life. Curing cancer, maybe, but no, not low-fat. See, the problem with a lot of brownie recipes is they either make them too sweet or too chocolatey, or both. I know some of you are crying “Heresy! Burn her at the stake!” when I say too chocolatey, but have you ever had chocolate that is 98% cocao? There is such a thing as too much of a good thing. You can’t enjoy it when it’s that powerful; the human senses weren’t designed to take it. It’s like being hit over the head with a sledge hammer. I have had a lot of low-fat brownies that were simply too intense. It was like eating cocoa out of the box. I think they were attempting to compensate for the lack of fat by distracting you with such powerful doses of chocolate. Anyway, my point was, this recipe is in balance. You will not be killed by over-doses. Unless you eat a lot of them. Each bite is balanced. How many you eat is the point of your own responsibility. I bear absaloutely one hundred percent no responsibility if you eat both 15×10 pans of brownies yourself, in one sitting. That’ll probably take you down. But you will die happy. 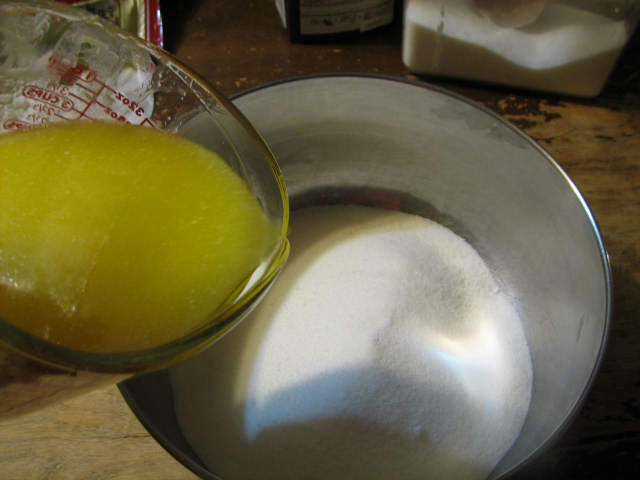 Put your 5 1/3 cups of sugar in a great big ol’ bowl. Yes, I have dirt under my thumbnail. That’s the real home-place of life. I was starting seeds earlier in the day. But don’t worry, it was sterile seedstarting mix. Sterile, ya hear?! It means everything in the dirt was killed dead. It’s clean dirt. Don’t worry about it. If it bugs you, remember to clean out under your nails before you make this recipe. Me? I’m a Troll. And I bake for Barbarians. 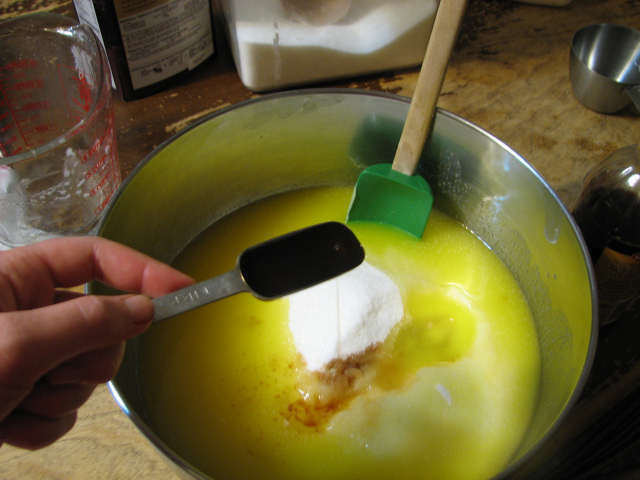 Pour your melted butter on top of the sugar. This is the foundation of all that is good and right in the world. . .
Now add your 2 tablespoosn vanilla. The real stuff, not the fake stuff. Did you know that every vanilla flower lasts for only a day—and sometimes less? And that every blossom has to be hand pollinated? There is one type of bee that will pollinate vanilla blossoms, but they don’t believe in being exported. So all the vanilla plantations need every single flower (and ONE flower equals ONE bean) pollinated by hand. Thar. I hath educated you. You’ll never again look at vanilla in the same way. Stir it all together. . . 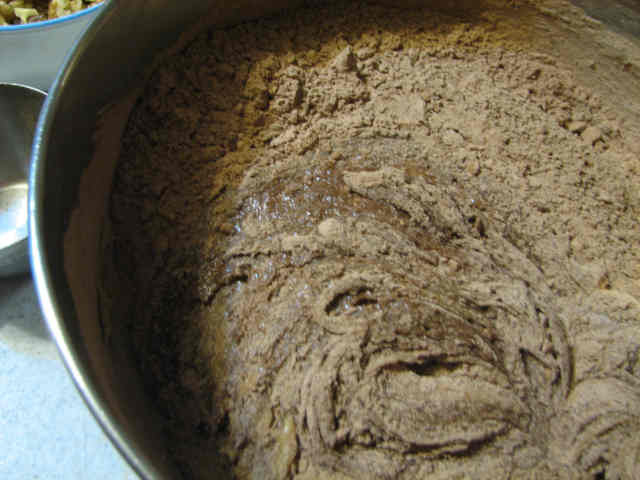 When you’re all done mixing it, it should basically look like. . .
. . .applesauce!! Isn’t that funny? I always think that’s funny. 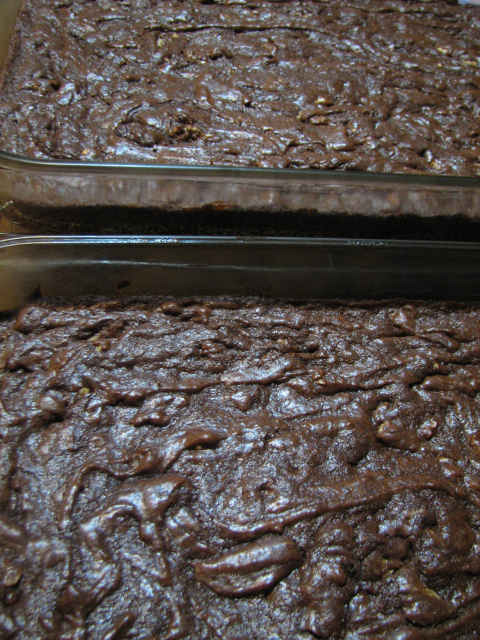 It’s especially funny ’cause lots of low-fat brownie recipes use applesauce as a fat replacement. There, applesauce masqurades ad fat. 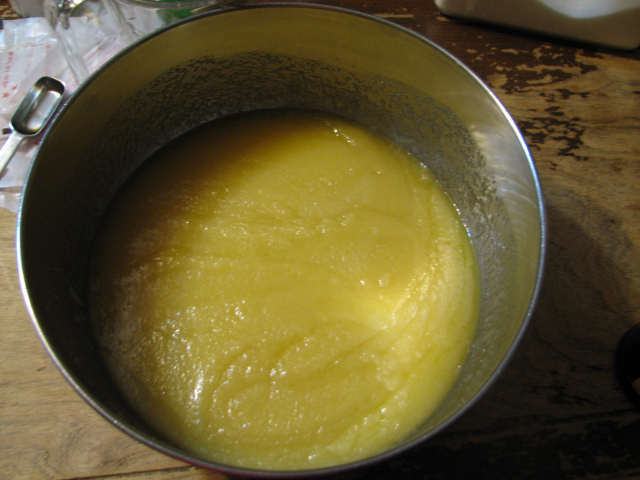 Here, fat masqurades as applesauce. Tee-hee! Nobody gets my sense of humor. 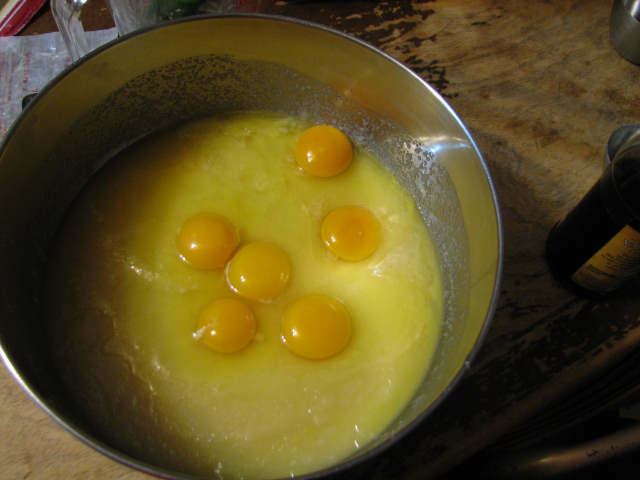 Now you have to add in your half-a-dozen eggs. 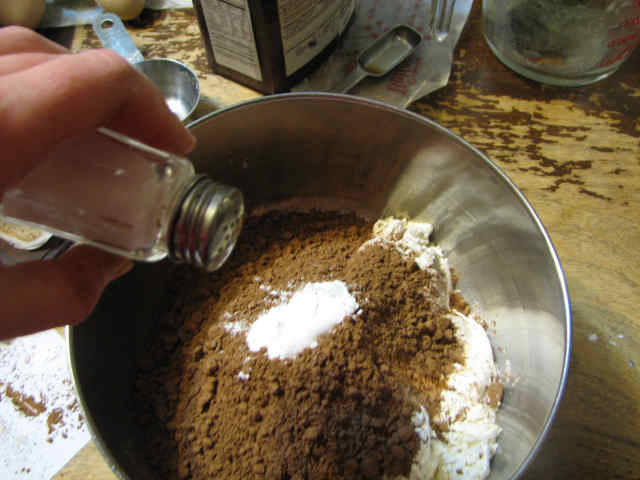 Mix it all together with sturdy spoon. If you don’t have a sturdy spoon, get one. You need it like, um, like birds need feathers. You and they will have a much easier time of accomplishing what you need to do. Actually, if you don’t have a sturdy spoon, you can use an electric mixer here. But later on in this recipe, YOU WILL NEED TO USE A SPOON! 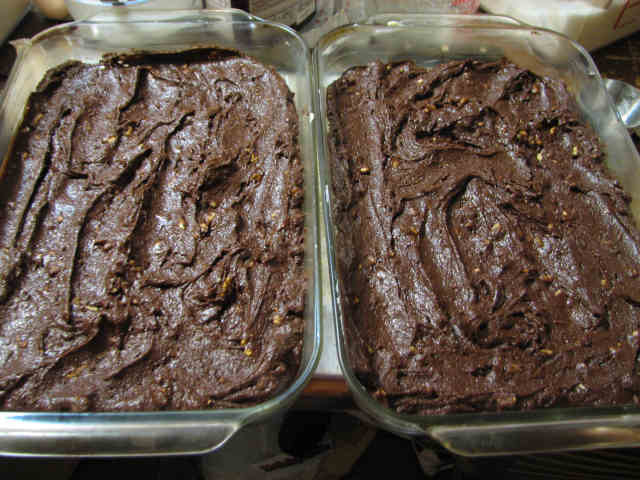 Brownies are allergic to overmixing. 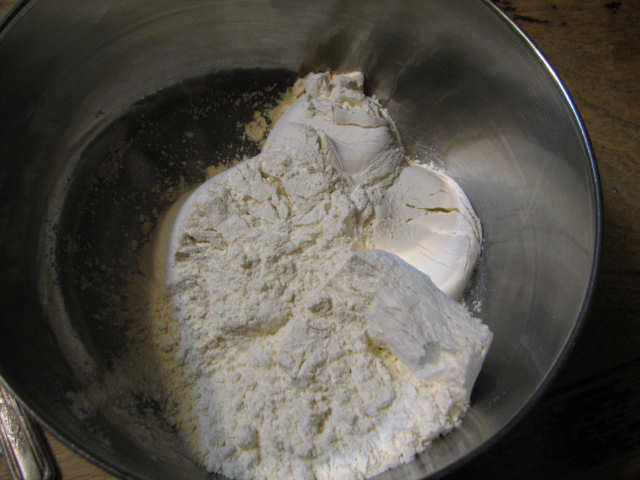 It doesn’t matter till we get the flour added in, but once that flour is wet, you must learn the meaning of gentle. Even if you are a barbarian. Okay, before we get any further in our mess-making, we need to attend to some other important matters. 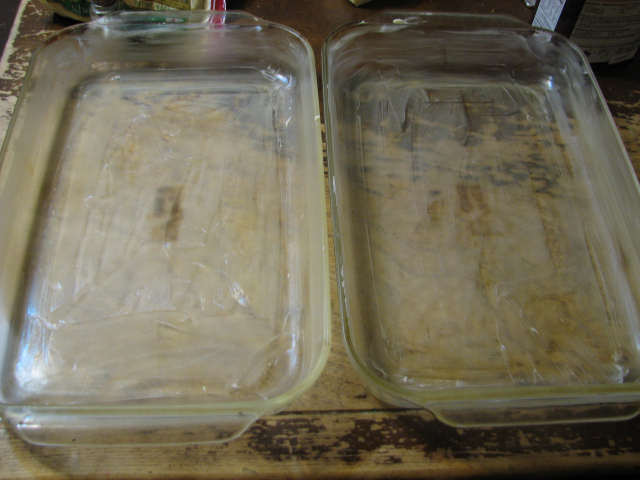 Like thoroughly greasing two 15×10 pans with lots of butter. No sissy baking spray. The real deal, man. 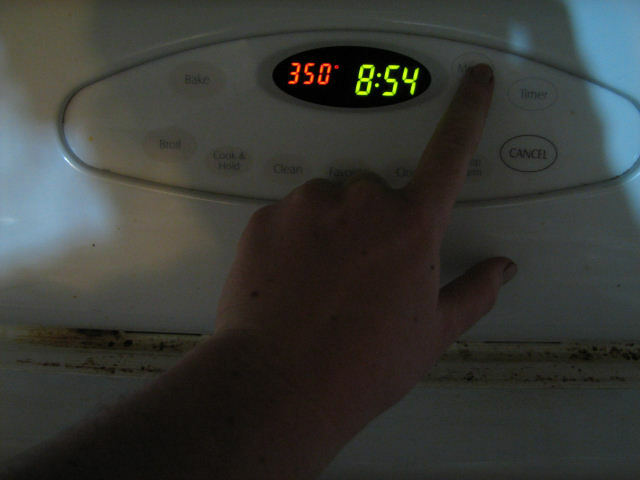 Another important matter is preheating the oven to 350. Guess what? It really is 8:54. PM. Isn’t that awful? I mean, it was when I took the picture. It isn’t right now. Actually, it wasn’t when I took that picture. I forgot. We set all of our clocks ahead by 15 or 20 minutes. Because it’s funny, that’s why. It’s our own little safe, secure alternate universe. No one in the world is on the same time as us. And then we have one clock set to real time, and then we always get confused when we’re talking about time. So it was probably closer to 8:35. Anyway, I blame that as the reason why all my pictures were blurry this time. The barbarians would undoubtably say that I ought to make brownies all over again and take better pictures, but guess what? These pictures have been sitting on the hard drive for almost a year now. If I am ever going to educate this world to the secret of happiness, it’s now or never!! 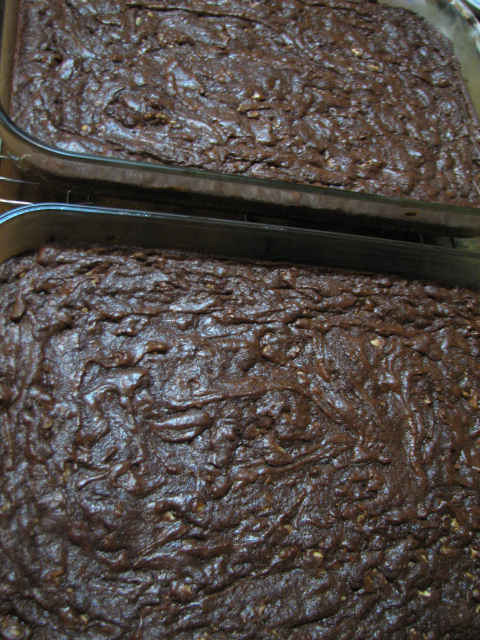 (And, no, I did not have a sudden break-down need for brownies; the boys needed to take them to work for a party the next day. I’m sure there is some reasonable reason why I’m doing it sooooooo [kinda] late at night. Like maybe they forgot to tell me until they came home that evening. Or something. I don’t really remember, but neither do they, so I’m pretty sure I can make up whatever reality I want. So they didn’t tell me until 15 minutes previous sounds like a good reason to me. 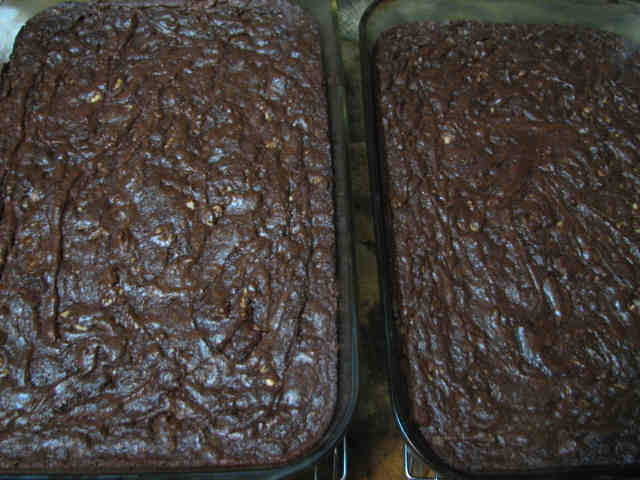 I am pretty sure them taking my brownies to work is the only reason they are so popular and famous. Now it’s time to mess with dry ingredients. 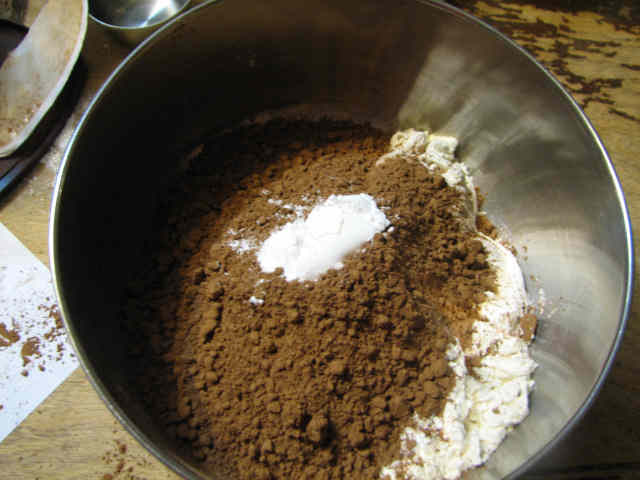 In a seperate, smaller bowl, add your 2 2/3 cups of flour. Now add the cocoa. 2 cups of it. And you thought I didn’t believe in chocolate!! Hah! It’s all about balance, man. Yin and Yang. Harmony and love. All that good stuff. No, really! I don’t know if you have ever noticed it before or not, but if you put a scant 1/8th of a teaspoon of cayene powder in a thin broth, it burns your throat going down. However, if you really load the cayene onto a piece of chicken, and that deep-fat fry it, it’s much more mild. Or if you put an 1/8th of a tsp. of cayene into a creamy-based sauce—you’ll find that a lot more mild than the 1/8th of a tsp. in a fatless broth. 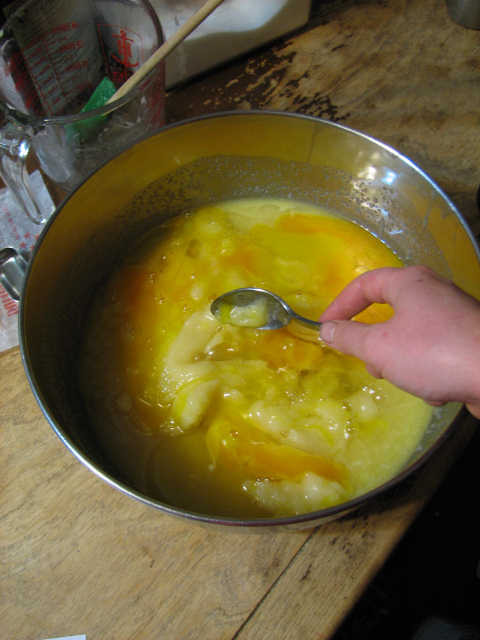 Fat has a reconciling effect on powerful flavors. 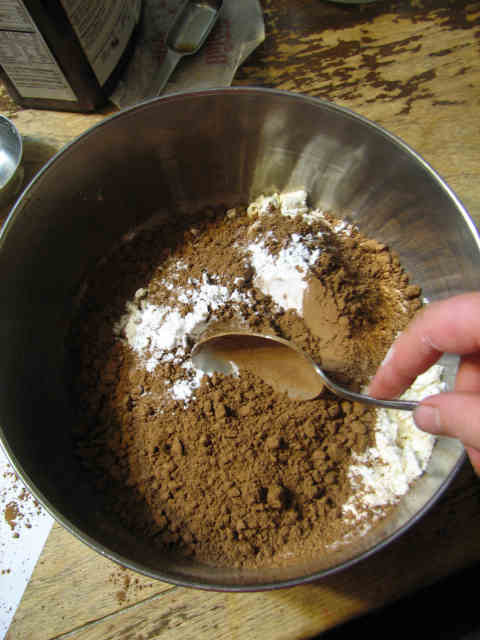 If you put this much cocoa in a lowfat brownie, you will have trouble trying to figure out what the difference is between making brownies and skipping the fuss and bother and just eating cocoa out of the box. The same goes for the sugar. All this butter makes the ingredients play nice. They’re just too harsh, otherwise. Too bossy, too overpowering. 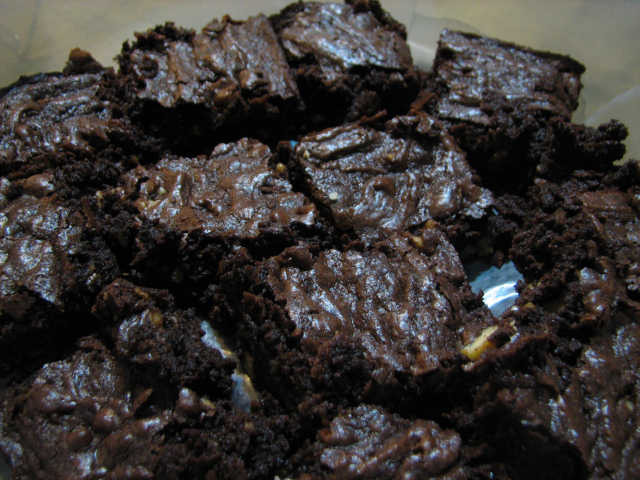 You should try it; if you know someone who is too harsh, too bossy or too overpowering, get them to eat these brownies. It’ll probably work. As long as their mouths are full. 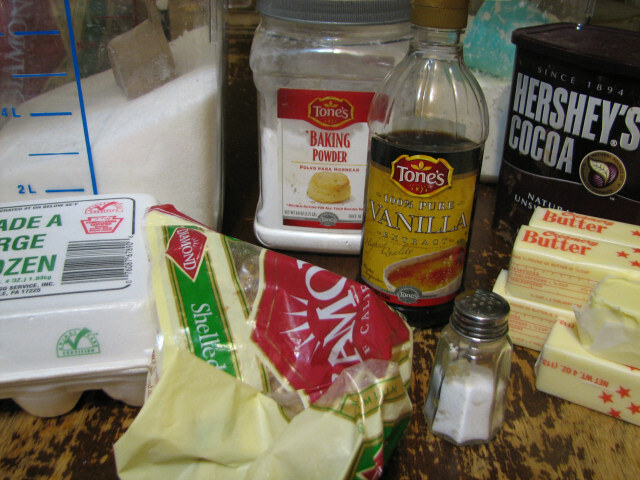 Add in your 1 1/2 teaspoons baking powder. 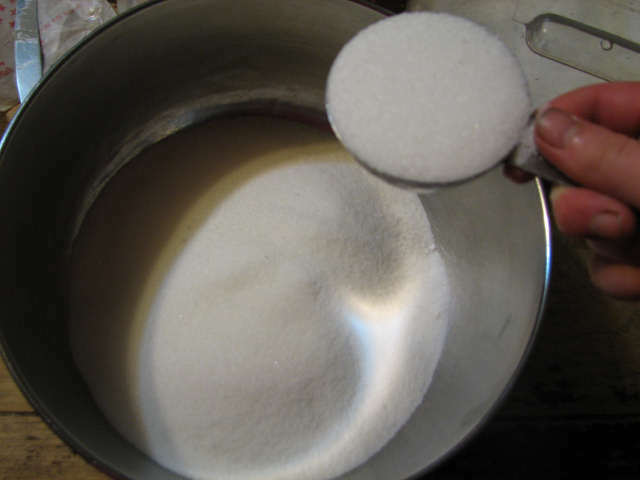 1 1/2 teaspoons is the same thing as half a tablespoon, did you know that? Probably not. 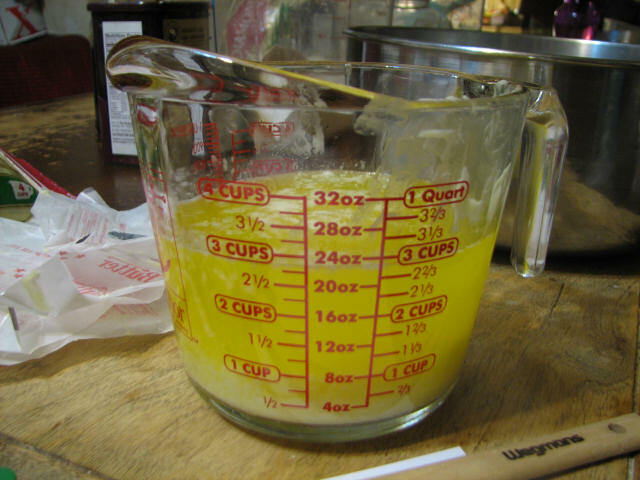 Most people don’t even make 1/2 tablespoon measurers any more. It’s like they don’t expect people to be using 1 1/2 tbl. of ingredients. What do they know? Oh, yeah. Add a dash of salt. People nowadays use too much salt. Name three places you can eat out (or three prepared processed packaged foods) whose predominate flavor is NOT salt. And then tell me, ’cause I can’t do it. Salt is good when used in moderation. Does anyone know what moderation even is any more? Guess what, guys. I just put 5 1/3 sticks of SALTED butter in there. It doesn’t need a whole lot more salt. 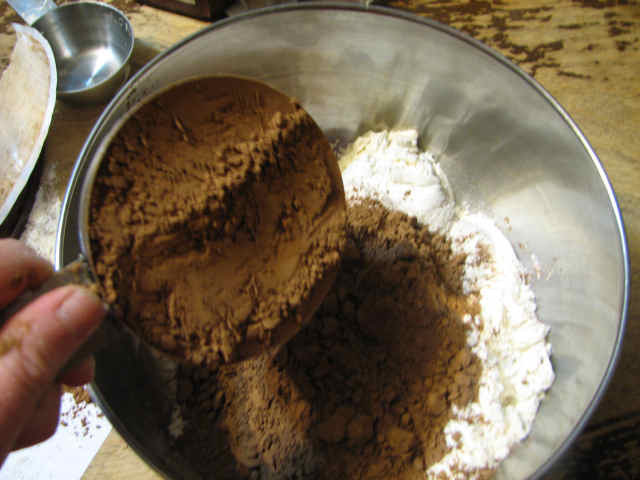 Try to get your cocoa lumps out now, because you won’t have a second chance once we add the dry ingredients to wet ingredients. If you’re really worried about it, you can sift it. 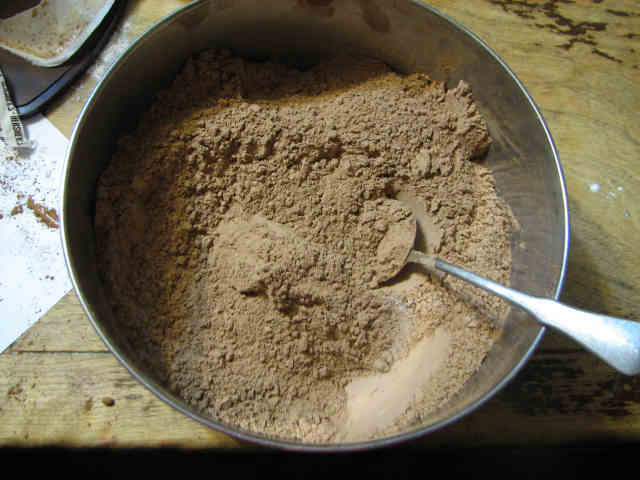 If you’re not, you can have little lumps of dry cocoa in your finished batter, and that’s okay. 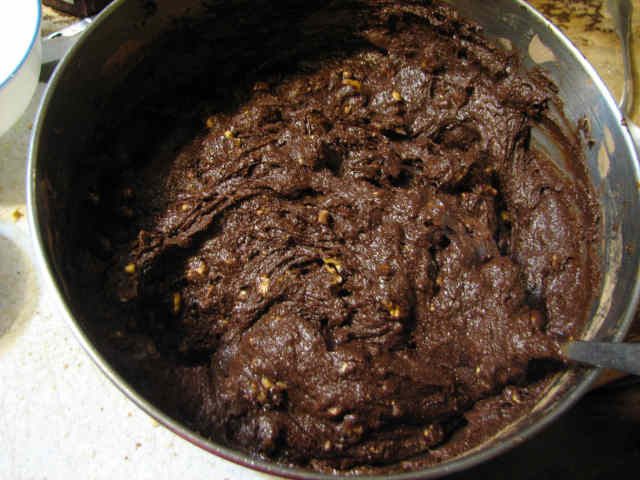 You won’t even be able to notice them in the finished brownie. 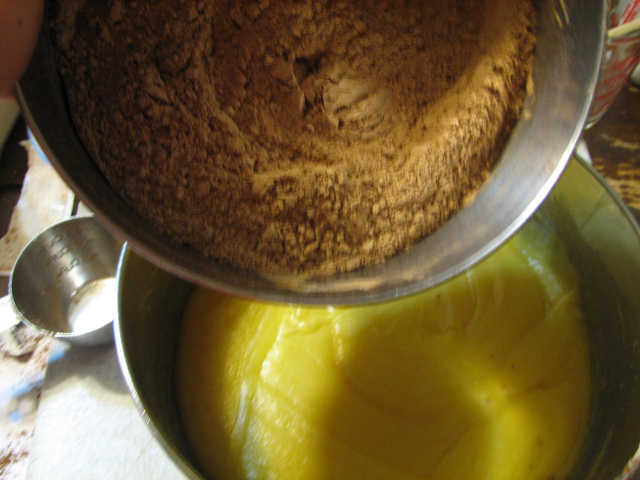 The cocoa soaks up all that butter. . .
Now we have to chop the nuts. Even if you don’t believe in nuts. Just kidding. 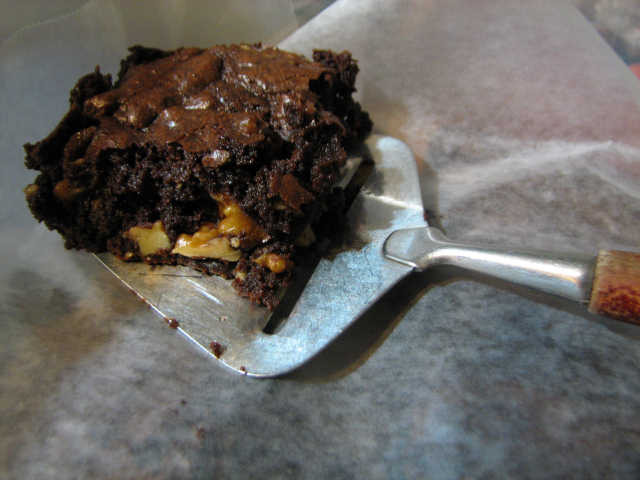 These brownies are borderline miraculous even without nuts. They’re just even better with nuts. 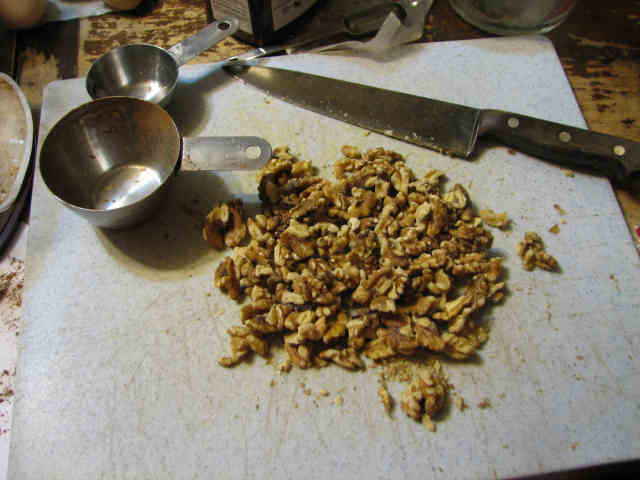 We use walnuts, because for the longest time they were the cheapest. Now, who knows? 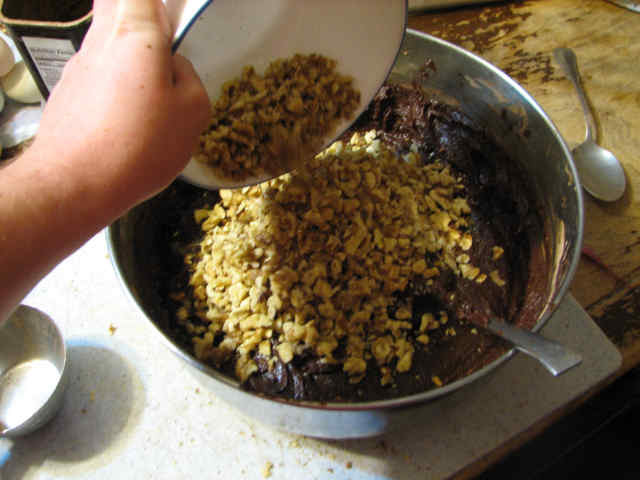 But our palate has already been trained to think that nuts in brownies = walnuts, so that’s what I do. Feel free to use pecans. Or almonds. Or peanuts. Or pistachios. Or even leave them out, I guess, but I think you’re really missing out. I chop them by hand, because that works best. No, really! If you try to use the food processor, you get big chunks and saw dust! And chopping them by hand is really very easy, and very fast. Yes, the picture is blurry and out of focus. It was after 9 o’clock at night, for goodness sakes. Besides, that camera hates me. And now the magic begins! Behold, the marriage of wet and dry ingredients! The Fleur de Lis continually protests “sugar” being counted as a wet ingredient. This is the part where you MUST NOT USE AN ELECTRIC MIXER! YOU MUST USE A SPOON! Using an electric mixer at this point will help you acheive hockey pucks. 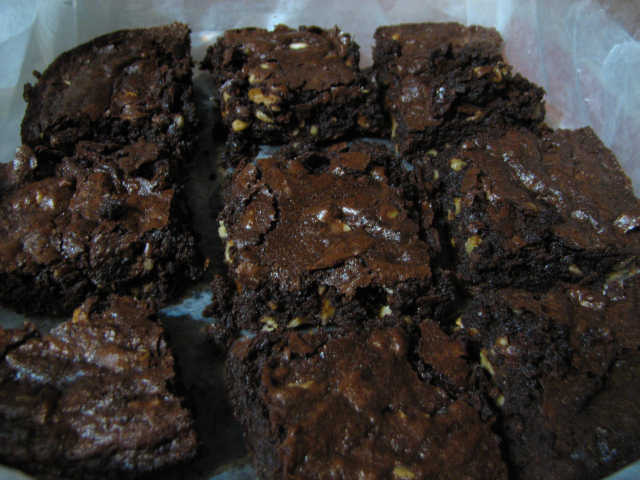 Not slightly chewy, melt in your mouth brownies. STOP!! That’s good enough! Yes, there are little lumplets of cocoa. Lumpettes. But we do not under any circumstance try to get them out now. If we keep stirring till we get them worked out, we will have doggy-chew toys. Remember that now: we’re making brownies, not doggy-chew toys. 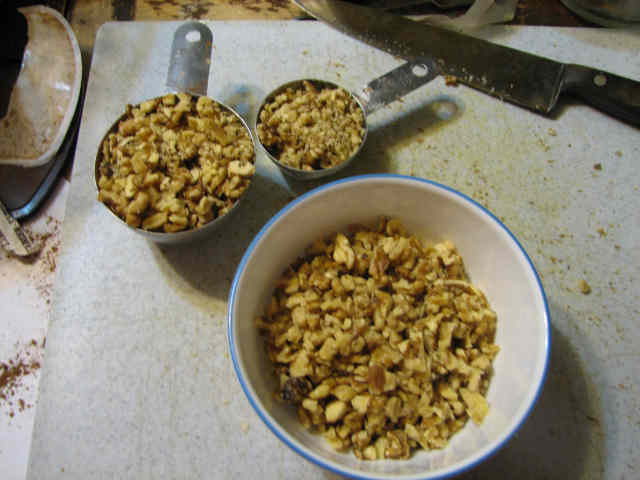 You may be wondering why we didn’t add the nuts back with the dry ingredients. After all, we’re supposed to be spending as little time as possible on the whole mixing deal, now that the wet has joined the dry. 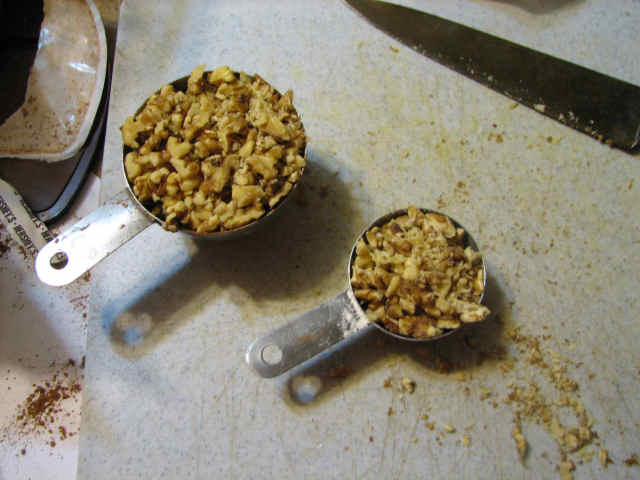 Problem is, if we add the nuts with the dry ingredients, the nuts like to protect little pockets of dry ingredients. So instead of biting into the brownie and—Oh! a walnut!, we get—Oh! a pocket of nasty-tasting baking powder. Not nice. So the nuts have to go in by themselves. But still. Don’t fuss too much about perfect distribution. Close enough is good enough. Then spread it in your two greased pans. . .
See how stiff it is? Don’t sweat it if yours is considerably looser. 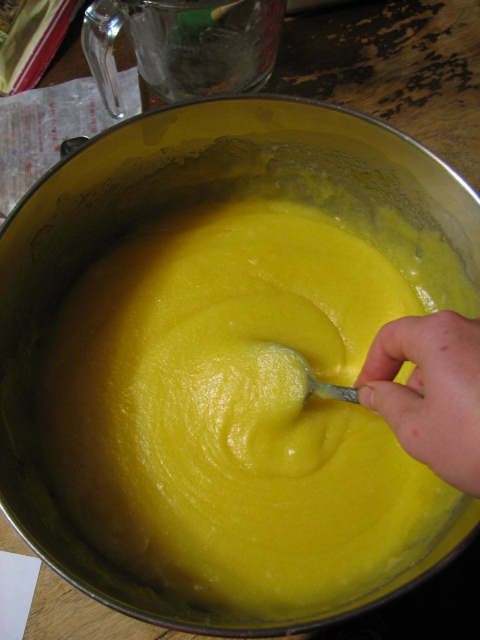 When you use so much butter, the consistancy of your batter is largely detirmined by the temperature in the room. 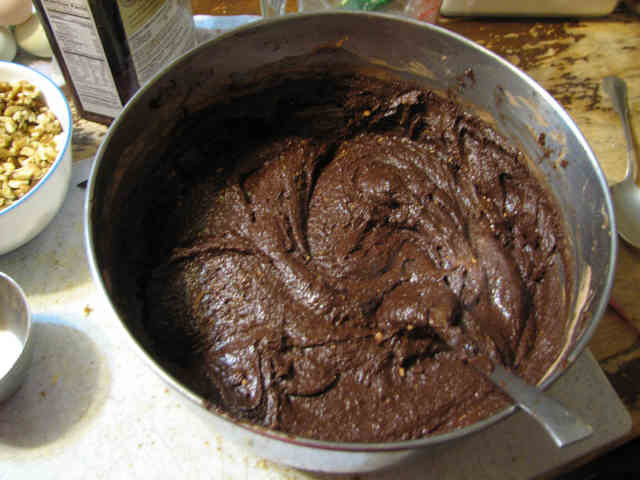 Winter brownie batter is much stiffer than summer brownie batter, because the warm weather keeps the butter sooooft. But both summer and winter brownies are spectacular. After all, they both wind up in the oven. Isn’t that lovely? 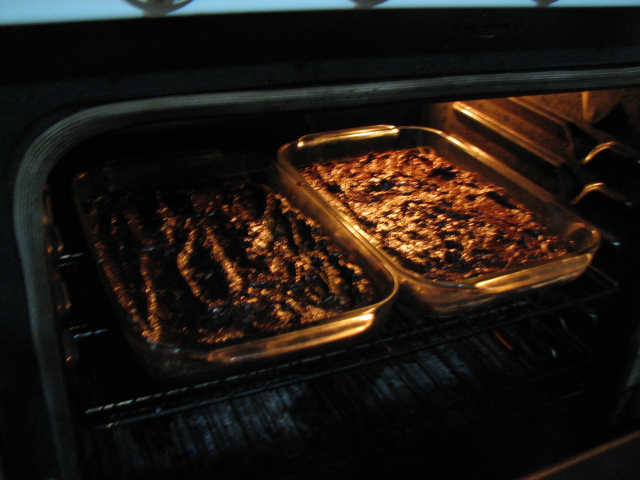 What could possibly be more comforting than a glowing oven full of brownies? They need to stay in there for about 25 minutes, but that’s just a ball-park number. When you have this much oven space taken up, you really need to switch things around half-way through, to keep one edge from being burned while the middle edge is still a little under-cooked. 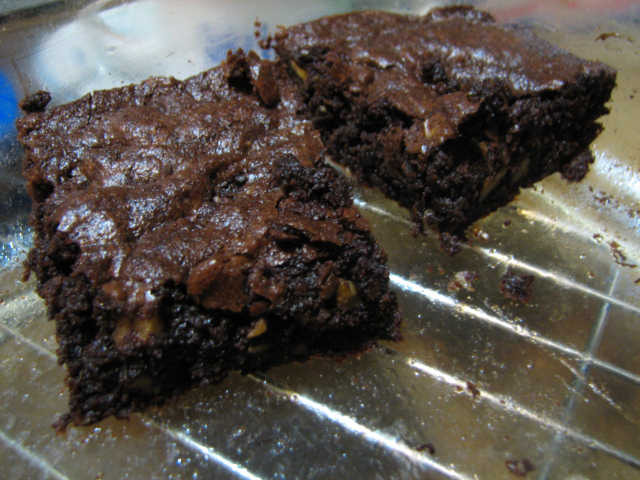 You want the edge of the brownie to be firm and crispy, BUT NOT THE CENTER! These will continue to firm up once they’re out of the oven—as they say, if they’re done in the oven, they’re overdone. The top will be crisped over, but if you push on it, it will give way readily. No matter which way you look at it, they still look good. Technically, you should wait until they’re at room temperature before you cut them. Only problem: waiting. Cooled, they well be just a touch more chewy, and hold themselves together well. Hot, they tend to fall apart. I had to package them up for traveling before I went to bed, so I cut them while still strongly warm—not quite falling apart, but not as firm as they will be at complete cool down. 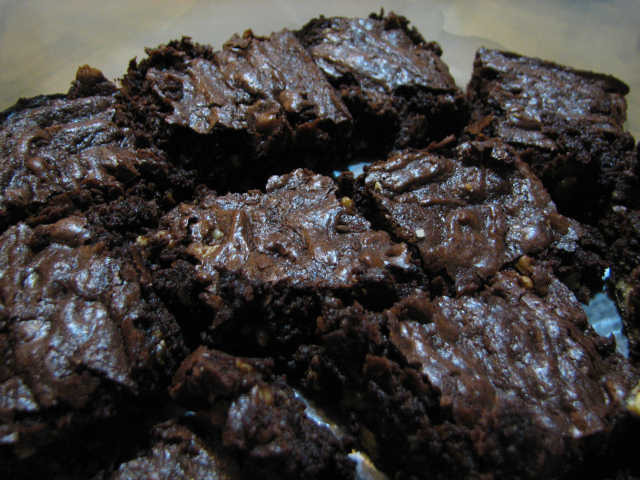 And did you know these brownies are prescription strength anti-depressants? Downside: very short lived. 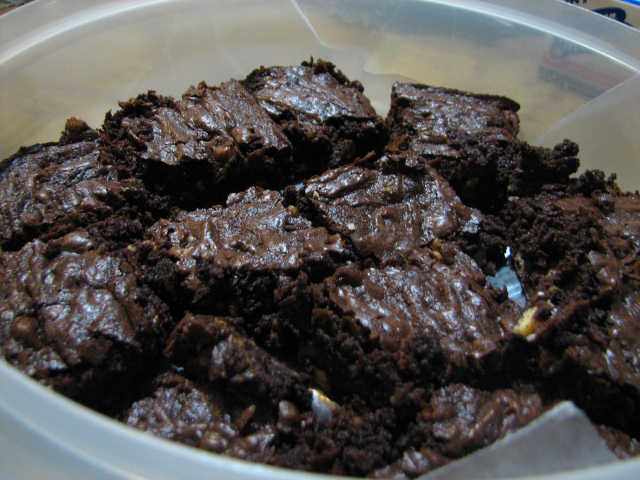 I think the depression comes back as soon as you finish eating the brownies. Upside? 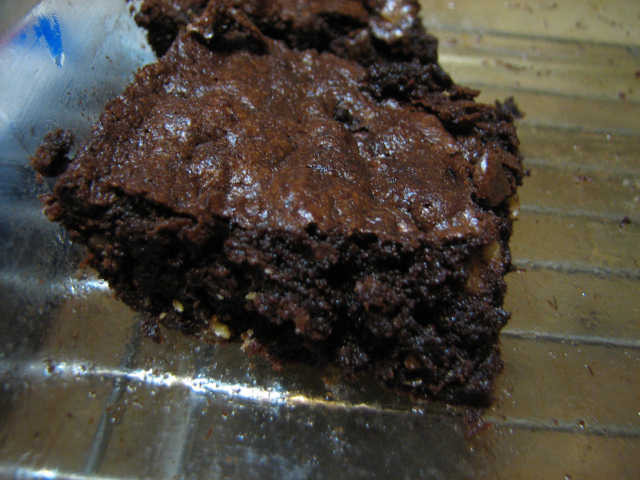 No one has ever reported suicidal thoughts while consuming these brownies. Could we please try raising rates? Crude-oil futures climbed to unprecedented levels Thursday, as weakness in the U.S. dollar, influenced by the U.S. Federal Reserve’s decision to stand pat on interest rates, sent prices to a peak above $140 a barrel. I don’t think that raising rates are going to cure all the economic problems we face. I don’t think there is a quick cure for all the economic problems we face. But when you depend on the rest of the world for financing, I really think that ignoring the value of your currency is a big mistake. Ave Maria is a favorite? It is common knowledge in the Ethereal Land that the Japanese have expensiveness tastes in toilets. But I never would have guessed that it was popular in Japan to play a catholic prayer while making potty noises. There is a hiccup, though, in this world-beating record. It happens inside the Japanese home, where energy use is surging. And nothing embodies the surge quite like the toilet — a plumbing fixture that has been reengineered here as an ultracomfy energy hog. Japanese toilets can warm and wash one’s bottom, whisk away odors with built-in fans and play water noises that drown out potty sounds. They play relaxation music, too. “Ave Maria” is a favorite. High-end toilets can also sense when someone enters or leaves the bathroom, raising or lowering their lids accordingly. Many models have a “learning mode,” which allows them to memorize the lavatory schedules of household members.